The 7.5m Stow-Away design is the next step up from the 6.5m model and can be towed during daylight hours. This design has a an increased beam overall of 3m which provides significantly more deck and internal space than the smaller 6.5m design. Still utilizing a pop-top to gain headroom in the cabin and all the innovative features of the smaller model, this design offers more comfort and space. The pop-top produces low sleek lines when down for less drag and clear vision when sailing. When at rest the internal layout is relatively spacious and more practical if compared with the 6.5m design. Performance is increased accordingly under power with a larger 60hp outboard engine recommended. Under sail the performance will increase in relation to the extra waterline length. This design allows for compact cruising for a small family over short periods. The accommodation is relatively comfortable with the pop-top raised and has a small galley to Starboard with an L-shaped dinette opposite. Interior Forward of the dinette is a double berth in the main cabin area. A nice feature in the main cabin is a line of vertical windows in the front of the cabin for uninterrupted vision forward. 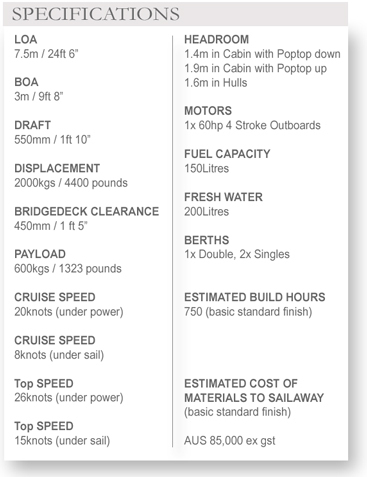 In the Starboard hull forward is a single berth with the option of another quarter berth aft below the cockpit. The Port hull has no accommodation and houses the centreboard case. On deck There is sufficient space for any style of recreation. The cockpit is generous in size with seating along the sides and back. Behind this is a good sized aft deck with steps leading down to the water aft. The foredeck is also a good space for lounging with a full width trampoline for dolphin spotting. Given the light weight structure this design will be manageable when towing, launching, docking etc. There is adequate space on this model for relative comfort while on board even with a small family for a few days at a time. Because this concept is easily beached it is ideal for camping trips where the boat can be pulled up on the beach with a camp site nearby. This is 'back to basics' cruising with an economical price tag. Kit packages are available for this design and the options can be viewed in the Stow-Away Kit page.